If you spend long enough in Canakkale and are sufficiently observant, you may notice there’s quite a lot of oak trees around. Once you see them, you realise that there are several in little groups dotted around the landscape, apparently lost in a sea of wheat, or with goats grazing the stubby grass around them. There is a nice example in Troy as you move past the sanctuary toward the caves and see that there is a little grove of oak in the field ahead of you. These are not the same as the magnificent Quercus Trojana or Trojan oak that you can see opposite the Southern Gate. 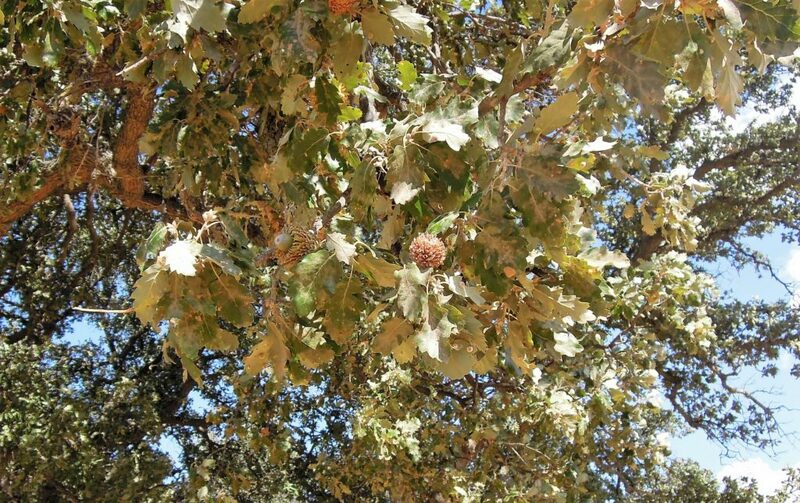 The Trojan oaks may grow as tall as 10 or 12 meters and have smooth cups to their acorns. But the oaks growing in groves have the most unusual cups around their acorns. Feathery and multilayered they form a large wreath around the acorn. 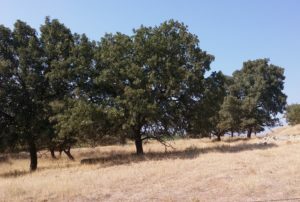 Charles Newton on his visit to Canakkale in 1853 described these trees as Quercus Aegilops commonly called Valonia oak. 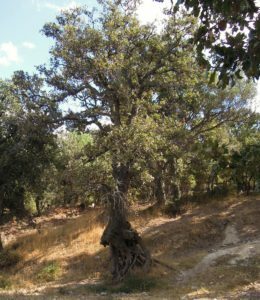 Wikipedia describes the Valonia oak as Quercus Macrolepis though acknowledges that it was previously thought to be a subspecies related to Quercus ithaburensis, Quercus libani or Quercus brantii. Another website describes them as Quercus ithaburensis macrolepis – (Kotschy.)Hedge.&Yalt. From a book on Turkish trees, the trees that appear to fit the description are Quercus ithaburensis or Anatolian Palamut Oak. This tree is described as growing from 15 to 20 metres, is within the Red Oak group and is common in Western Turkey. It has the largest cup of all Turkish oaks and the acorn takes two years to mature. These cups were once the mainstay of the local economy here in Çanakkale, traded and exported in large amounts for their use in tanning leather. Newton says the acorns themselves were given to the pigs or burned. Frank Calvert, the discoverer of Troy, and his family had a large farm called Thymbra and they exported the acorn cups for use in the tanning and dyeing industries in England. The use of leather began almost 9000 years ago but the Sumerians were the first to describe the process of tanning leather. On clay tablets from 5000 years ago they mention urine, dung, acorns, pomegranate rind, grape leaves, grapes, oil, flour, milk and alum being used for tanning. The oak dust used for tanning was known to come from the land of the Hittites, Anatolia. The cups are called palamut in Turkish (not to be confused with the fish, which is also plentiful in the autumn) and were stored in depots along the banks of the Sarıçay river in Çanakkale. They are rich in tannin while the acorns are not and can even be leached enough to eat (though they lose nutrients too). Currently these depots have been demolished to make way for modern buildings and the few that remain have been converted into art facilities. Nowadays, though the process of tanning is similar to that used by the Sumerians, the chemicals have changed with potassium chrome sulphate used instead of palamut dust. Though the processing is a lot quicker, it’s probably a lot more harmful to the environment than the palamut. 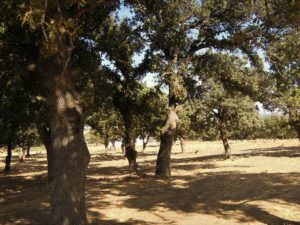 The largest stand of oaks that I know near Çanakkale is near Özbek, just to the north of town. On both sides of the main road you can see scores of large oaks. Walking among them, they are spaced at intervals and obviously regularly planted. I imagine they might be 200 years old at least. The land does not seem to be used for anything other than grazing and I sincerely hope that it stays that way, though there are signs of destruction of some of these wonderful trees. Up near the graveyard you can see the tenacity of the oaks, clinging to life though the land around their roots is stolen and litter builds up instead. 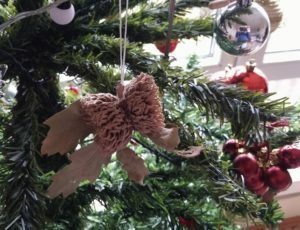 The oak has been revered in many cultures over the centuries. It was mentioned by Pliny as being an important part of Celtic worship with oak rituals supervised by Druids. Even the word Druid may be derived from the Irish or Welsh words for oak. 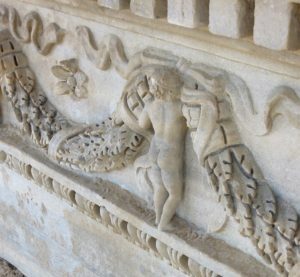 Currently surrounded by olive groves, carvings from Alexandria Troas include some beautiful oak leaves. Interestingly Strabo mentions a place called Drunemeton (or Drynemetum) which was an important meeting point for the Celts in Galatia, currently central Turkey. The name probably means “sacred oak grove”. The Galatian Celts held fast to their Druidic religion, effectively cementing their separate identity within the Anatolian cultures.